Heat oven to 350°F. Lightly grease a baking sheet with cooking spray. Unroll French loaves onto baking sheet. Cut 4 to 5 half-inch-deep slits in the top of each loaf. Bake loaves 30 minutes until golden brown. Cool 10 minutes before slicing. Melt butter in a large cast-iron skillet over medium heat. 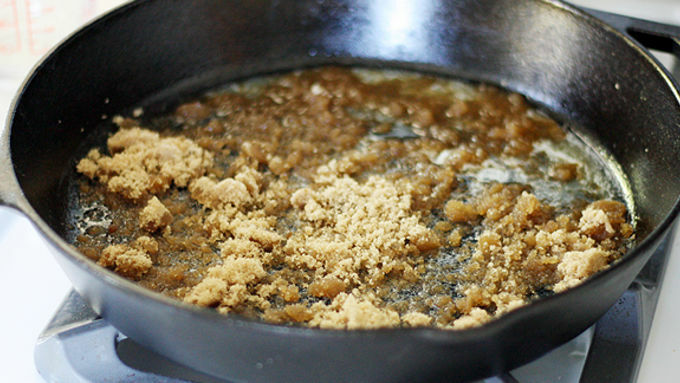 Remove from heat; sprinkle brown sugar in the skillet. Slice French loaves into 1-inch slices. Spread a generous tablespoon of apple butter onto a slice; top with another slice of bread to make a sandwich. Repeat with remaining slices. Arrange sandwiches slices of bread evenly on top of butter-brown sugar mixture in skillet. In a large bowl, whisk eggs, milk, vanilla, cinnamon, ginger and salt. Pour batter over bread in skillet. Sprinkle with chopped pecans. Bake (with oven still on at 350°F) for 30 to 40 minutes until egg mixture is baked through and tops of bread slices are a deep golden brown. Serve with powdered sugar and maple syrup for topping, if desired. Adapted from The Girl Who Ate Everythings Overnight French Toast recipe. 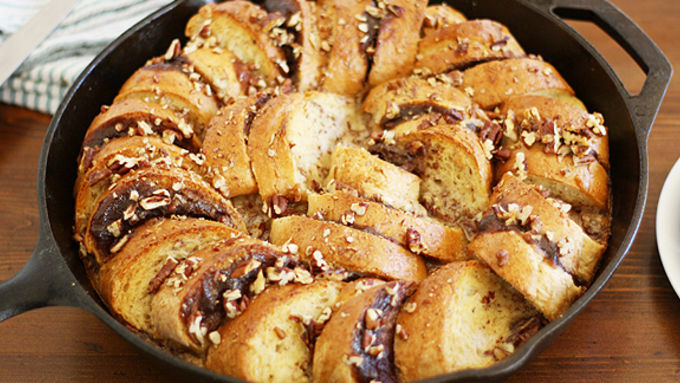 Apple butter snuggles up to French toast and bakes in a cast iron skillet. Inspired by The Girl Who Ate Everything's Overnight French Toast recipe. 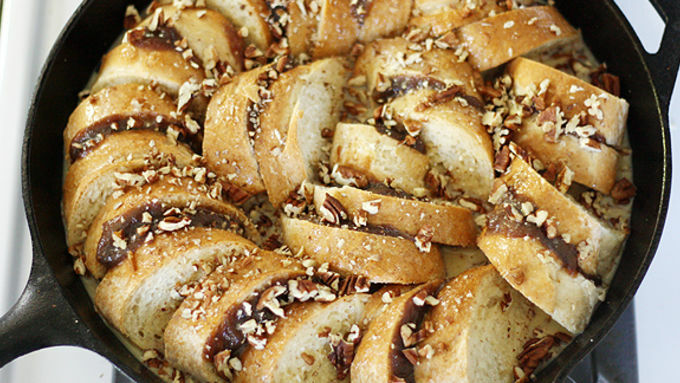 Who knew tradition could taste so good? Call me crazy, but I kiiiiiiind of want to just cozy up inside this Apple Butter French Toast all autumn long. Who’s with me? But seriously, can you imagine anything better than waking up to this goodness baking in the oven on a cool fall weekend? Few things will get me out of bed faster than yummy food, and this is no exception. Sweet apple butter is sandwiched between slices of fresh French bread, which is topped with chopped pecans, which get all toasty in the oven amid the seasonal spices of cinnamon and ginger…sigh. Breakfast just doesn’t get much better, really. Isn’t it just a glorious sight of gloriousness? 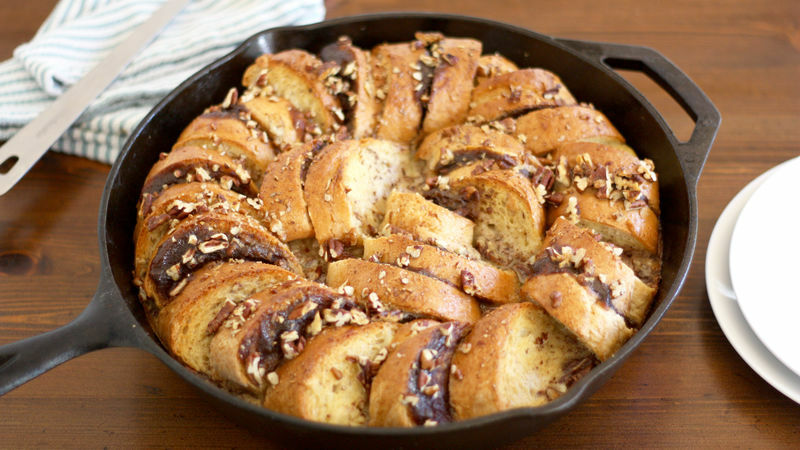 Serve up slices with powdered sugar and maple syrup, and watch everyone fight for seconds (except for me, of course – I’ll just be thinking about cozying up in that skillet).